Janus Fouché is a South African digital artist, working in multimedia projects ranging from interactive electronic musical installations, animation, to self-organizing biological systems laser-engraved onto paper. He is most known as a collaborator, having worked with contemporary artists and composers such as William Kentridge, Blessing Ngobeni, Deborah Bell, Philip Miller, João Orecchia. He focuses on the digital space as a parallel, abstract, but equally present universe, with its own laws and aesthetics to be constructed, explored, and reflected upon, revealing the underlying systems and relationships of our own experience. Fragments of both worlds are pulled into one-another to create new, unexpected relationships. Organic generative drawings of artificial life, Collages of film and animation meet motion captured puppets and mechanical personifications. a living algorithm that exists only as a synthesized sound-scape. The Organism is a digital generative audio composition, a living algorithm that exists only as a synthesized sound-scape. It has a pulse, interconnected cellular-structure, and decision-making nerve-centre. With sound being a transparent medium, the listener is invited into the creature's physical anatomy while different parts of it are played together - through these cellular connections. A self-made musical instrument: drone machine and atmospheric harmony synth. The instrument uses a virtual sound-engine (written entirely in Pd, running on a Raspberry PI computer), and hardware interface with patch-points with knobs and switches for parameter control, with musical expression via OSC. Turning to the Irrational when the rational falls short, Debuted at the Performa 17 Biennale in New York. The performance is a combination of the language-breakdown of the poem, and a collection of new associations and visual interpretations for the viewer to try and make sense of. Non-narrative and associative, looking for a non-Cartesian logic, and playing within that space. The video is tightly co-ordinated to William's pace, and timed and played as an expressive instrumental layer of the performance. My credit: Video Designer, Video Performer. A generative video installation commissioned for the 2017 Deep Learning Indaba. The Euclidean sequencer project illustrates a selection of Computer Science concepts that, through their growing role in our lives, become greater than themselves. Optimization algorithms branch into philosophy once they start influencing our frame of reference, optimizing what we get exposed to. In this case, visually expressing an ancient mathematical system-turned-music-generating machine. A euclidean sequencer is a mathematical musical generator, that uses subdivisions in a measure as common denominators to equally space notes, and create rhythms. In the paper: The Euclidean Algorithm generates Traditional Musical Rhythms , Godfried Toussant finds that many traditional rhythms from across cultures (West-African, Southern African, Bohemian-European, Middle-eastern, Latin-American) are described by this algorithm. Thousands of ants explore the world, leaving a trace of their path for others to follow. A scent-memory. The visual result finds its way somewhere between lightning, roots, and branches. The tree gradually grows, from that first point, to an intricate tangle of branches 20, 000 generations later. An exhibition on the notion of purpose from the perspective of the three artists, using completely differing mediums. Digital artist Janus Fouché explores the lack of intention behind emergent ecosystems by means of generative algorithms, which are then either burned onto paper by laser light or printed in ink. Puppet artist Mienke Fouché delves into evolution and the lack of purpose to mere existence through her skeletal wood sculptures. Jewellery designer and manufacturer Reinhardt van Zyl investigates abstraction in jewellery as an art form that, in essence, serves no purpose other than being an aesthetically pleasing form of adornment. A video-capturing algorithm, that uses frame-on-frame blending techniques to achieve a watercolour painted image. A playful inversion of the light-painting phenomenon in slow-exposure photography. this interactive algorithm records the scene, turning video feed into a morphing animation with a slow anti-exposure: where dark colours are blended over time instead of light. Dancers become silhouettes, movement becomes paint. Light-sources and lightly coloured objects take minutes to imprint, completely absent at first, and are instantly erased by any darker shape that comes after. An animated painting, for the Black Board Projections film installation. This short animation was commissioned by, and shown during Season 1 of the Centre for The Less Good Idea. The painting was done by Johannesburg artist Blessing Ngobeni, and was then digitally cut-up, and animated using motion-capture data of various dancer collaborators during the Season. The idea was to experiment, and play with the harsh imagery of Blessing's collage work, and the eerily smooth, glitchy, unforgiving data of motion-captured dance. Limbs dislocate, bodies contort and rock, knees twitch, into a gradual animalistic frenzy. A film installation is built into a mechanized panel proscenium structure with sliding and rotating panels, programmed to move as characters in the projection. This mechanized multimedia puppet proscenium is a continuation of the Lulu opera project. 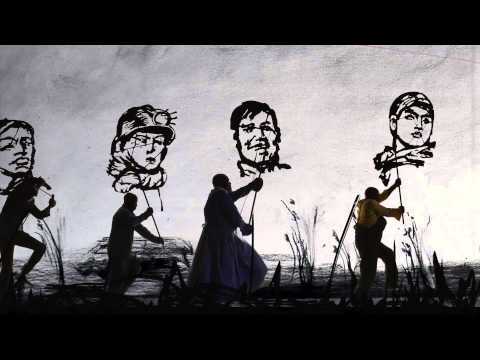 Drawings from the opera are combined with filmed footage. The music of Webern and Schonberg are combined with 1940's German swing and the Ursonate by Kurt Schwitters, forming a collage that moves between nightmare, longing remembrance, and cabaret performances. The projection surface is broken up with panels of paper and cardboard of different texture and colour. The film concept is further broken up when the cardboard panels start moving across the stage, turning, shifting, and eventually taking on personalities of their own. They become the protagonists of the piece, lovers that conspire together and end in a dance. Three electric creatures explore a dark digital room. This is an emergent molecular dynamic algorithm. A collection of simple impersonal rules that bring about unexpected expressive behaviour. A swarm of particles moves through three dimensional space, with very few very simple rules- Particles are attracted to one another (to an extent), and repulsed by one another (to an extent). The swarm is divided into three groups, and it is this behaviour that both keeps them together, and propels the body of particles forward. Particles themselves are not visible, but certain individuals within each group are connected with lines, based on distances between them. This connection method creates an unstable electric creature. There is also an an interaction between the three creatures: Particles from different creatures agitate one-another dramatically, straining their atomic bonds, causing the creatures that share the same space to clash violently. I see in particles a digital comparison to atoms in our world. Basic building blocks that are constantly in motion, with basic rules yet infinitely diverse results. I don't tell them what to do- but set in motion the circumstances they need to create something beautiful that I would not be able to achieve otherwise. An 8 screen video piece, a procession of figures over a charcoal landscape. A Danse Macabre - everyone from priests and politicians to their receptionists, to refugees or the destitute carrying their possessions, pulling trolleys or the dead, the sick, moving toward the same fate. At the same time they are the unnamed figures casting shadows in Plato's allegory of the cave, the workers and labourers behind the scenes of the story. "If we ever get to heaven, we will be the ones working to make the thunder." There are elements of Medieval dancing to avoid the Plague, and a reference to the Chinese cultural revolution. My credit: Video editing and construction. Eye Film Institute Amsterdam from 25 April to 30 August 2015. Lichtsicht 5 Bad Rothenfelde from 18 September 2015 to 7 February 2016. A 5 screen video installation, projected on surfaces of the Hotel Splendid Palas first floor lobby, on the Büyükada island of Istanbul. This piece explores the time around Leon Trotsky's exile in Istanbul, and his secretary Evgenia. Behavioural theorists of the time framed organic life as complex mechanical systems, where providing set input parameters will result in a predictable response. At the same time, advances in technology, with new exciting developments in electronics and industrialization, moved closer to the dream of "perfect machine", arriving at the same point- where machines take on human traits, and become sentimental. My credit: co- video-editor and -compositor, with Žana Marović. Control circuitry and software for the sentimental megaphone machine. I also performed the theremin in the sound track composed by Philip Miller. An interactive musical bronze sculpture installation. Towering larger than life-size bronze sculptures of mystical figures on a journey by Deborah Bell, given life and expanded by an interactive sound composition- in a collaboration between myself, composer Philip Miller and sound engineer Gavan Eckhart. I created a media player system to play back 5 a channel sound-scape composition by Philip Miller, each track dedicated to- and playing from above each sculpture independently. Each channel is looped separately, creating a constantly shifting and drifting organic composition. Along with this I put together a sensor network, to sense the presence of a viewer. This proximity is used to directly control each of the five channels' volume separately. An empty room is completely silent. When you step close to a sculpture, the sound starts to gently rise from the figure, drifting to silence only a few moments after you leave. More viewers at a time change the nature of the piece fundamentally but to no less value. These are not simply samples or sounds being triggered: the composition's structure is given a finely tuned balance between flexibility and choreography, to bring about a deeper experience. This is not interaction as a game, or toy, but in the service of a truly contemplative and subtle emergent piece. My credit: Interaction design and software. Forming part of the Second Hand Reading exhibition, megaphones attached to singer sewing machines each play a voice of an African choir singer, performing a composition composed by Neo Muyanga. The sculpture has a hand crank, that drives the music as a hand-cranked record-player. One can drive it at any speed or direction, playing the choir fast and high, slow and low, or at a constant pace -in an attempt to keep the wavering tune constant. There is also a further mechanical element, each megaphone turns in a slow arc while singing, combining mechanical movement and gear systems with digital signal processing and interaction design. The mechanical sculpture was built by Christoff Wolmarans and Chris-Waldo de Wet. My credit: Design and construction of the software and circuitry.